Partz is Not Just Partz "Because your project can only be as unique as the materials you use." Measuring 1 3/4" high (with a vertical hole running through the middle) and 1" shoulder to shoulder, the torso is perfect for a lot of interesting projects. The clay is soft enough that you can edit the shape with a sanding block to fit your application. All torso come with eye pins at the arms and at the top of the legs to attach limbs. Save 15-30% with Mixed & Match Partz: 14 categories (the best of our "partz") for you to make your own bundle... designer pricing AND a wide variety of choices! 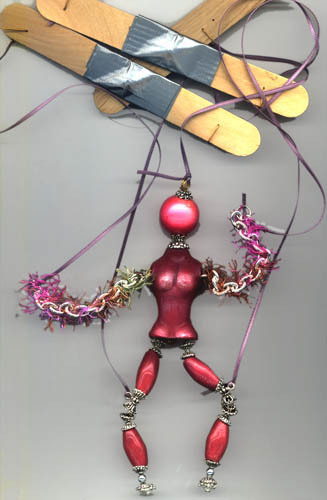 Starting with a polymer clay torso bead and a creative mind, make a fully functional marionette that you can dress in costume, add extra features and then put on a show! The Modern Marionette Kit. Not for the faint at heart, and definitely recommended for those who like to experiment with materials and even stray from the directions with confidence. This project was quite a challenge to engineer so that it could be "kit ready". We have alternate versions in the works, creating a smoother, lower profile arm design, adding eye pins on torso for attaching clothing, offering painted face beads for the head plus offering several types of string and paddles. NOTE: Thin white cording is included in the kit for puppet controls. Ribbon pictured here is for visual reference only. 3 Wooden control bars (holes drilled) and white cording to make your marionette move! Your marionette does not come with any costumes. A simple tunic can be made by cutting a 4" strip of fabric, creating a hole in the center, and then simply tying the tunic closed with ribbon. If you have problems with an item, or need more pins, caps, whatever please contact us. We will be happy to assist you with this cool new kit. Tools you will need: Round nose pliers, needle nose pliers, wire cutters, super glue. We offer this kit in several "versions", and will be offering a deluxe version with tunic fabric, paintable face, handbag and shoe charms. 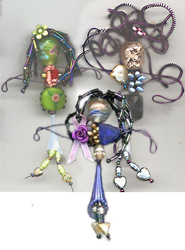 Check Our Wired Woman series -- great for gifts, parties and looks different each time you make one. Holiday Wreath Earrings-- Make darling little holiday wreaths, quickly and easily with this kit. 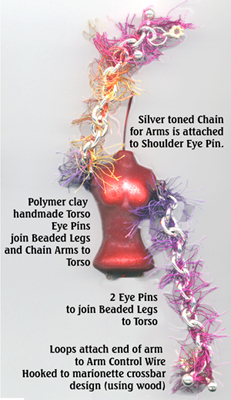 Easy to make with beads & wire included. Comes in holiday colors of red, green, silver & gold. The CD Evening Bag Recycle with style! Using CDs and some clever design, make a fabulous evening bag that will make a statement! Filigree Flutterby-- These interesting winged insects make great pins and can be painted and beaded in many number of colors. Wire Holiday Wreath-- These tiny wreaths make the perfect lapel pin and are quick and easy to make. *Orders must total $30 before shipping is calculated. Discounts on purchases over $200 show up in your total (US orders only.... please inquire on international). $15 added to orders under $30. Free US shipping and insurance on orders over $500. Fees and discounts are included in shipping total. Make your project unique with our PARTZ!